Stan Hieronymus, the author of “For the Love of Hops” joins me this week to discuss recent trends in hop varieties, hop techniques and brewing better beer with hops. Today on the show Stan Hieronymus joins us to talk about the dozens of new hop varieties as well as trends in hops and brewing with hops. Stan is the author of “For the Love of Hops” and also won the 2015 AHA Governing committee achievement award. He also wrote “Brew Like a Monk” and “Brewing with Wheat” (all Amazon Affiliate links). Stan discusses some of the new trends in hops and also the move towards exploiting aromatic oils in hops while still producing high yield, high alpha hops. We talk about the dozens of new hop varieties entering the market as well as why it takes so long to get a new hop variety developed for commercial production. 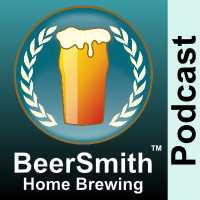 Stan tells us about some of the popular new hops entering the hop market, and we talk about some “hard to get” hop varieties. We talk about aromatic hop oils which seem to now be driving the hop market to a large extent. We discuss how the use of hops in beer brewing has evolved away from the use of “flavor hops” or late hop additions and instead towards whirlpool, steeped and dry hops which better preserve aromatic oils. We talk about the utilization of whirlpool hops as well as how home brewers can steep their hops at flameout to achieve this effect. Stan discusses some of the new trends in dry hopping including shorter hop contact times and the limited use of dry hops during active fermentation. Stan tells us a bit about various hop extracts including CO2 extract (which are used in the boil like regular hops), isomerized hop extracts (that can be added at any point) and also aromatic hop extracts specialized to capture certain key aromatic oils. We close with a discussion of Stan’s new book on indigenous beers which comes out in September.